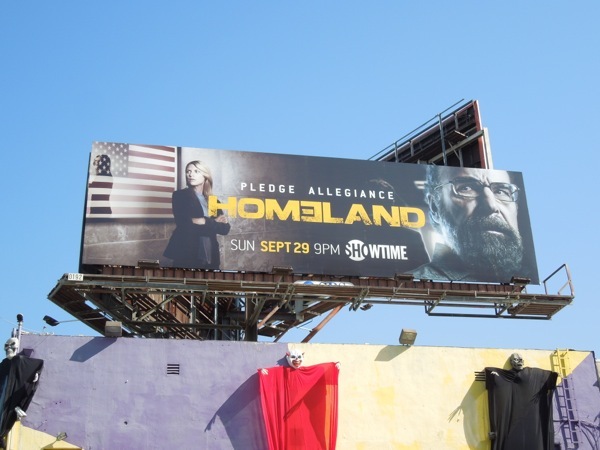 Are you ready to 'pledge allegiance' to the third season of Homeland? Showtime's terrorism thriller's third season may not have had the same cliffhanger as last season, but the real question for this third outing for the drama is where can this show possibly go next. 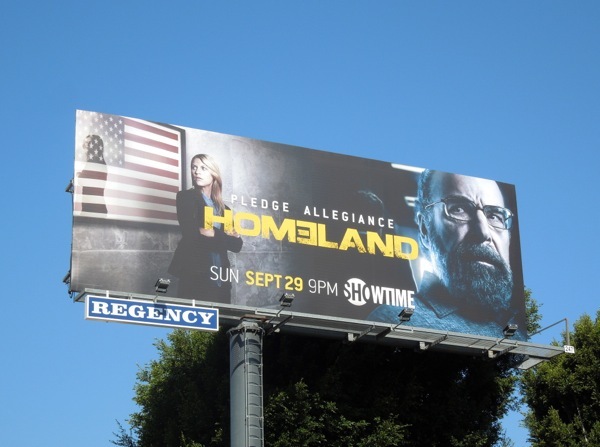 After allowing the U.S. Vice President to die via cellphone, the death of terrorist leader Abu Nazir, car bombings at CIA HQ and 'Brody' escaping to Canada with 'Carrie's' help, let's hope Homeland doesn't devolve into the absurdity of the latter 24 seasons with too many shock plot tactics. Last season Mandy Patinkin's Middle East Division Chief 'Saul Berenson' was being interrogated by the CIA, then in the blink of an eye (and an explosion of a bomb) found himself in charge. 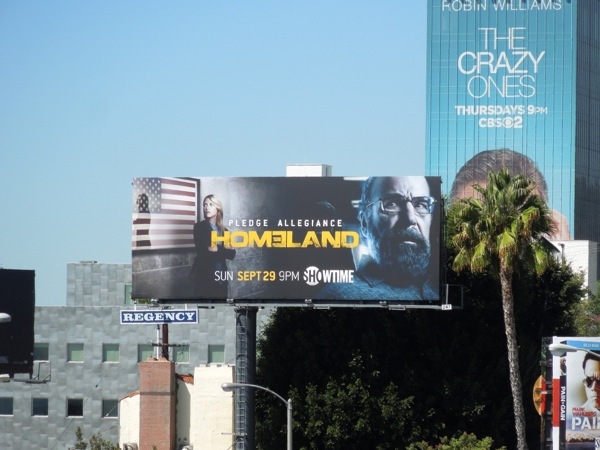 From the looks of this ad creative for the third season he has an even bigger part to play, especially with the return of his wife, but there's something about him that Daily Billboard doesn't quite trust. Is he a mole, or is that too obvious? Meanwhile Claire Danes bipolar CIA Agent 'Carrie Mathison' looks like she may be returning to active duty standing in front of the American flag, whilst former Marine 'Nicholas Brody' has his back turned and is shrouded in shadows, is that because he's on the run, or we're still not sure where his allegiance lies? 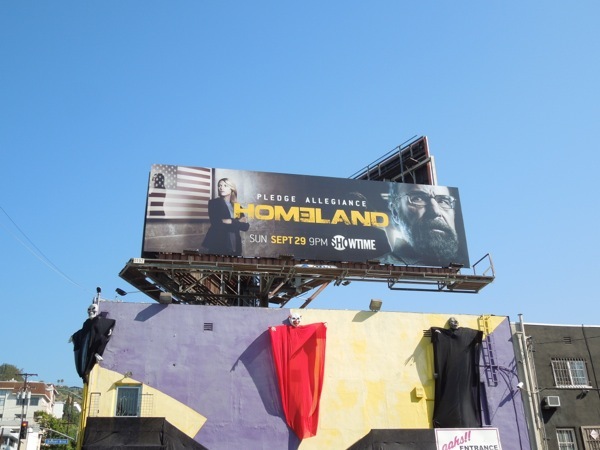 This intriguing Homeland season three billboard was first spied along L.A.'s Sunset Strip on August 30, and snapped again on September 13, 2013 at Sunset Boulevard and San Vicente Boulevard. 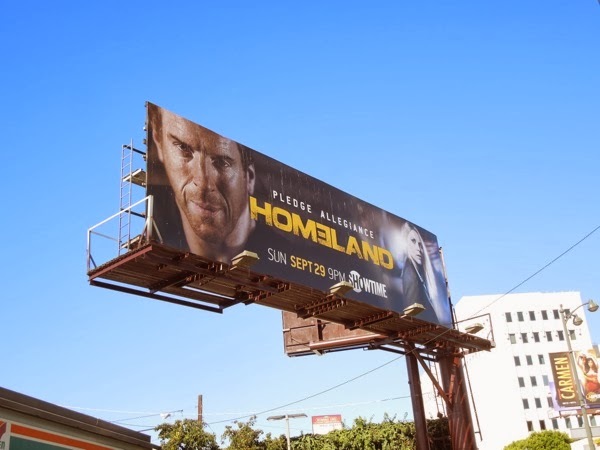 If you're a fan of the show like Daily Billboard is, be sure to also check out the Homeland season one billboards and the Homeland season two billboards from around the streets of L.A. and New York City. 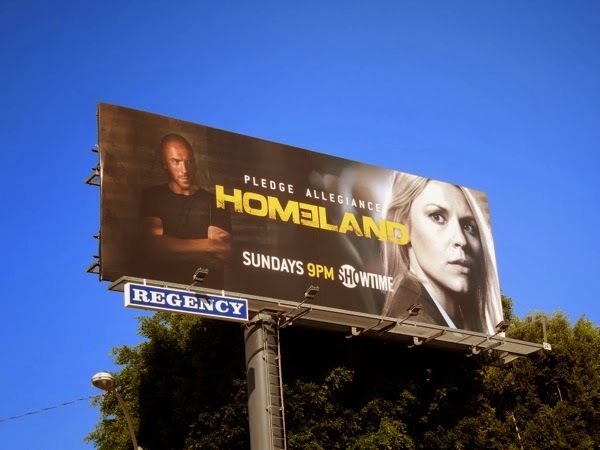 UPDATED: Aside from a handful of billboards and some advertising on the sides of buses, Daily Billboard hasn't seen that much out-of-home ad support for Homeland's third season. 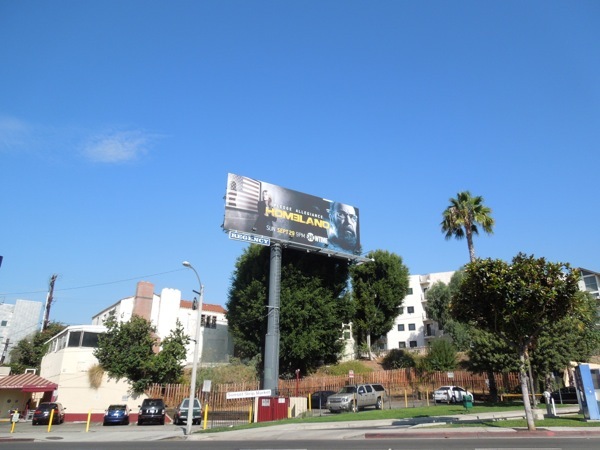 Maybe Showtime feels the Emmy and Golden Globe Award-winning series doesn't need the additional exposure when positive word-of-mouth is doing the trick, but here's a different Brody-themed ad creative for season three that was spied along Wilshire Boulevard at Highland Avenue on October 5, 2013. 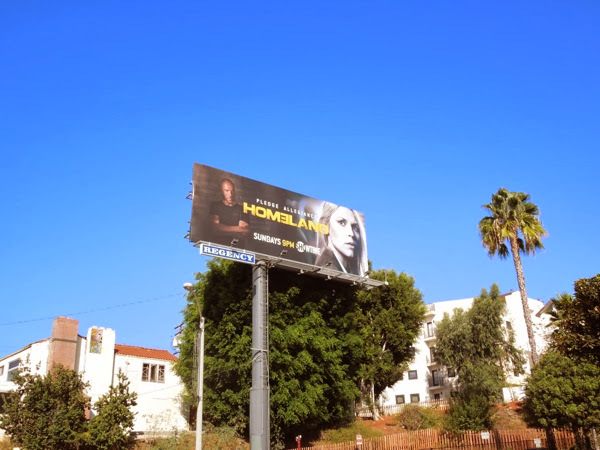 UPDATED: He may have been absent from the first couple of episodes in season three, but Brody is back in another ad creative for Homeland along L.A.'s Sunset Strip. 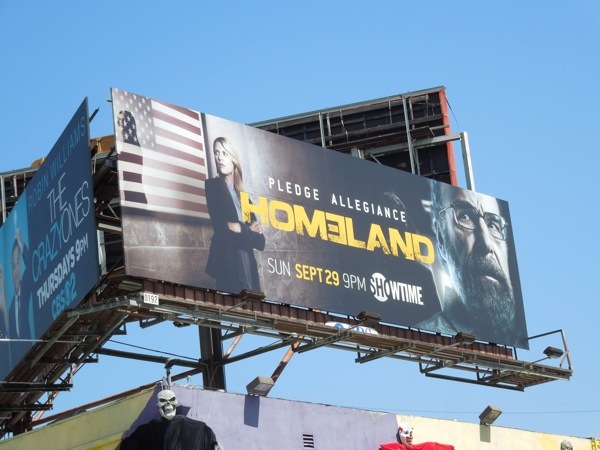 This third season billboard featuring the crazy, conflicted lovers was spied on October 14, 2013.